Does your puppy have more energy than you ever thought possible? Is the early sunset making it tough to fit in playtime or walks? 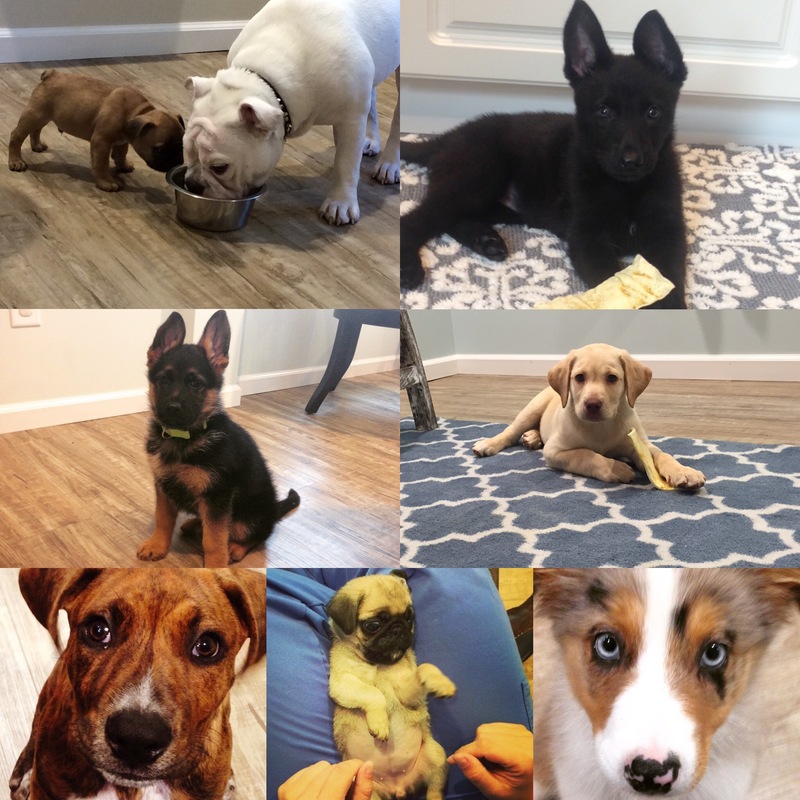 We are excited to invite you to a puppy social hour at Charleston Harbor Veterinarians. 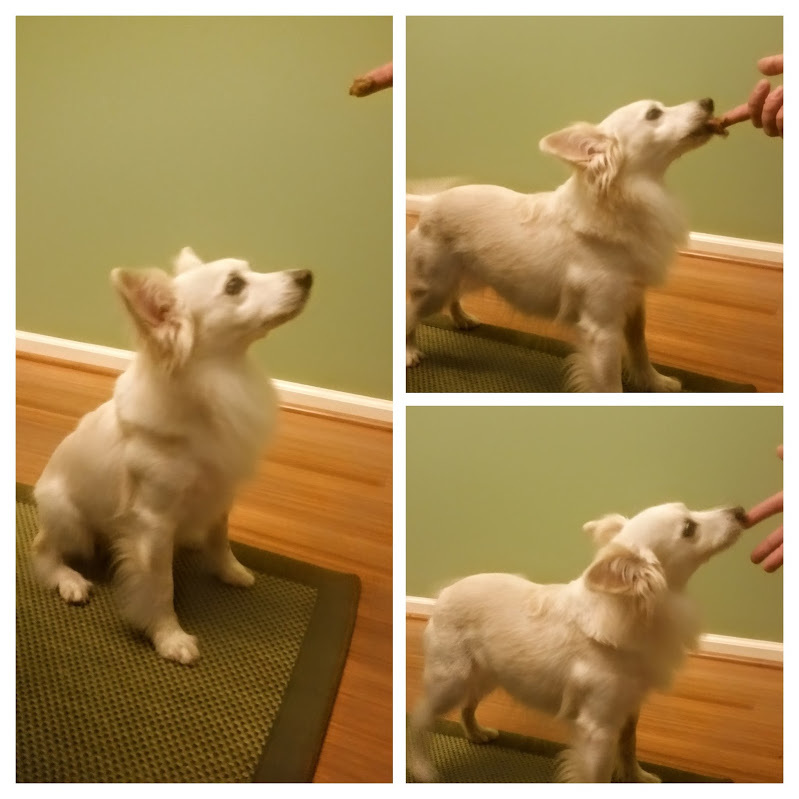 This is an opportunity for your pup to have some playtime while you relax with a snack and a glass of wine or beer. Purely Positive’s C.C. 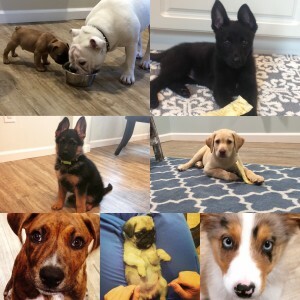 Casale will be here to answer your questions about behavior and training as well as to encourage appropriate puppy play. Please make sure your pup is over 10 weeks old (under 5 months) and up to date on deworming and the DHPP booster vaccine. Please keep your puppy at home if you have recently noticed diarrhea, vomiting, sneezing, or coughing. Have you ever wondered what heartworms look like? If you look closely, you might catch a few wiggling heartworm microfilariae in this video of a blood sample! On the 1st of each month, don’t forget to give your monthly heartworm and flea/tick prevention to protect your furkids from these nasty guys! Summer is full of celebrations involving fireworks, none bigger than our Independence Day on the 4th. Dogs and cats react to fireworks as individuals. Some aren’t upset by the explosions, and others get hurt by panicking and jumping through closed windows or bolting through doors to get away from the terrifying noise and lights. American pet advocacy groups point out that the number of escapees is so high that Independence Day is the busiest day of the year in shelters — and that many pets get lost, injured, or killed. Charleston is fortunate to have great emergency hospitals that will be open 24 hours in case your pet is injured. Check our resources page to find their contact info. Community websites and Facebook pages are also a great tool to help lost pets get reunited with their owners. 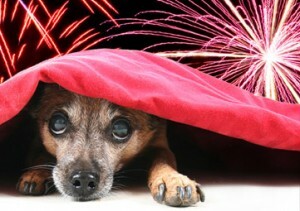 Your pets will do better if they’re not left home alone during fireworks events. That’s not always feasible, so think ahead before leaving them alone. Nervous pets tend to drink more water, so keep more available than usual. (And remember, these summer events usually mean hotter weather, and the likelihood of power problems, so extra water is already a good idea.) Bring outside pets inside, so they can’t bolt. Keep your cats securely inside, and if your dog needs a potty break during the fireworks, take him outside on a leash, even in a fenced yard. Make sure all your pets are wearing an ID tag or a collar that contains your phone number. Tags and collars can be lost, so a microchip is even more useful in helping you find your lost pet. Calming caps cover a dog’s eyes to reduce visual stimulation. It’s easier to prevent a fearful reaction than it is to reverse one. If your pet is nervous around loud, unexpected noises, a short-term sedative before the fireworks start may be just the ticket. Talk to your veterinarian ahead of time, so you can have something on hand to give your pet before the fireworks start. Some medications often used for fireworks or thunderstorm phobias in dogs are Xanax and Valium. Some severely anxious pets may benefit from drugs like clomipramine or fluoxetine that increase the level of serotonin. However, these drugs can take several weeks, if not more, to build up to an effective level, so this is not spur-of-the-moment fix. You have many choices of how to help your pet cope with fireworks stress. Talk to us about what is best for your pet. Hopefully, everyone in the family will then be able enjoy the holiday!